IN UPPER EGYPT. The Aswan Dam was built in 1899-1902 near the First Cataract on a rib or natural syenite crossing the river bed. The dam was arranged in two sections. The first section, beginning on the east bank of the Nile, consisted of a wall of solid masonry 1,800 feet long. 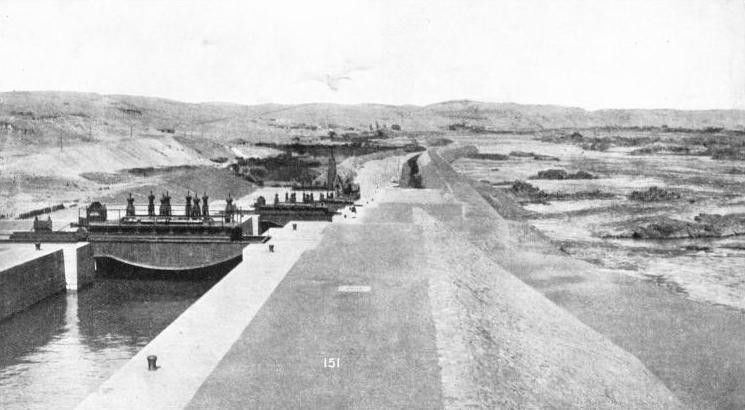 The second section, extending to the west bank, was 4,600 feet long and was provided with sluices and a canal, with a series of locks (shown in the foreground of the photograph) for the passage of river shipping. RIVERS are often, without adequate justification, called the arteries of a country. The Nile and its great tributaries may justly be called the arteries of Egypt and the Sudan. On this great river, famous from the beginning of recorded history, but so recondite that its sources were not discovered until the nineteenth century, depends the livelihood - and indeed the existence - of millions of human beings. During its course through Egypt the Nile is flanked by enormous deserts. On the west is the Libyan Desert - an extension of the Sahara - and on the east the Arabian Desert. It is only along the course of the Nile that the soil can support the life of a settled community. Without the river the whole country would be a desert. If the Nile were a normal river it would still be of prime importance to those who dwell along its banks. It has, however, a characteristic which makes it unique among the world’s rivers. Every year, during the late summer, it overflows its banks, and great tracts on either side are covered. When the waters have receded, they leave a layer of silt which makes the ground thus covered among the most fertile in the world. The advantage of this flooding is its regularity. Rivers all over the world have their occasional floods - some beneficial, some calamitous - but the Nile overflows annually with a regularity that can be predicted. The flooding is always beneficial and it has occurred from time immemorial. The ancients, though mystified by this annual phenomenon, took advantage of it to the limit of their powers. The silt-covered land was cultivated but the flood water was wasted. The idea may have occurred to some enlightened ruler of Egypt that the waste water might be impounded and used for irrigation, but engineering science was not sufficiently advanced for comprehensive schemes of this kind. It would, however, be erroneous to underrate the capabilities of antiquity: a country which built the Pyramids should have been capable of damming the Nile. The problem that baffled antiquity is now solved. To understand the solution and to appreciate the siting of the various modern barrages, it is necessary to trace briefly the course of the Nile from its sources in Central Africa. Far south, beyond the Equator, lies Lake Victoria, the second largest fresh-water lake in the world, with an area of 26,200 square miles. From the northern end of this lake a river, known as the Victoria or Somerset Nile, flows north over the Ripon Falls into Lake Kioga, in Uganda, and thence generally north-west to the northern end of Lake Albert, reached by a series of rapids, ending in the Murchison Falls. Lake Albert is fed by the River Semliki, which drains Lake Edward. From the northern end of Lake Albert the young river, here known as the Bahr-el-Jebel, flows north. At Rejaf, in the Sudan, it reaches the level of the plains. At Lake No, some 480 miles north of Rejaf, the river is joined by the Bahr-el-Ghazal, flowing from the west. The river now turns east. Fifty miles beyond the confluence is the junction with the Bahr-el-Zerat. Thirty miles farther the Sobat, from the highlands of Abyssinia, adds its volume, and the augmented river again turns north, as the White Nile. At Khartoum, 1,100 miles downstream from Rejaf, is the confluence of the Blue Nile, or Bahr-el-Azrek, whose source is Lake Tana, in Abyssinia. Beyond is the first of the waterfalls (the Sixth Cataract), and twenty-four miles south of Berber, the Nile is joined by its last great tributary, the Atbara, also flowing from Abyssinia. The passage of the Fifth Cataract is followed at Abu Hamed by a sharp turn to the south-west, with Meroe beyond the Fourth Cataract. Then the river makes a bend to the north-west and north past Dongola and the Third Cataract. Wadi Halfa, beyond the Second Cataract, lies on the Egyptian border. Then comes Aswan, with the First Cataract and the Aswan Dam, referred to below. Farther north is Asyut. This part of Egypt, from the Sudanese frontier to Cairo, is known as Upper Egypt. At Cairo the Nile divides into several branches, forming a complicated delta. The most important branches are those named Rosetta and Damietta respectively. Lower Egypt comprises the region of the Delta. The total length of the Nile is approximately 4,200 miles. The annual flooding of the Nile is caused partly by the constant rains of the Equatorial areas round the great African lakes and partly by the Abyssinian monsoons. The Equatorial supply, regulated by seepage or percolation, reaches the swamps near Lake No, and arrives, virtually intact, at Khartoum. Here it is joined by the Blue Nile flood. Farther north, at Atbara, arrives the Atbara flood. In days gone by, the farmers of the Nile Valley set, to work as the floods receded, tilling the rich black earth deposit which countless successions of floods had left on either side of the river. The ancient Egyptians watched the floods carefully, their irrigation officers were high officials in the Government, and masonry gauges known as nilometers were erected by them to record successive high-water marks. A perfect ancient nilometer still stands on an island near Aswan. But in the Middle Ages, and right down to the middle of the last century, a kind of chronic laziness gripped the people of the Nile Valley, who made no proper attempts to regulate the existing blessings of Nature. A TOTAL DESCENT OF 69 FEET was provided by the four locks which formed part of the canal system by-passing the Aswan Dam. The canal, partly carried on an embankment and partly cut through rock, was 6,540 feet long, including the locks. Three of the four Stoney lock gates are visible. On the first gate is seen the roller path on which the gate slides, when necessary, into its recess. The object of modern irrigation in Egypt and the Sudan is to provide a continuous flow of water to the fields instead of taking advantage of a yearly wasteful flooding. The natural rise of the Nile is 40-45 feet in Upper Egypt and 20-23 feet at the Delta. To make full use of the rise, and to provide continuous irrigation of the fields, successive generations of engineers have built an elaborate system of dams and barrages. These works enable them to store up the water during flood time and distribute it from the artificial lakes so formed after the normal flood would have gone down and away out to sea. The most difficult problems had to be solved when the nineteenth-century engineers made their first attempts to form a barrage across the river. These pioneers had no previous examples by which to profit. Napoleon, on his Egyptian expedition, had predicted the building of a dam or barrage at the head of the Delta. The first attempts to build such a barrage began in 1833, under the direction of the Viceroy Mehemet Ali. There is reason to suppose that Mehemet Ali’s intentions were as much for personal aggrandisement as for the real good of the country. He crowded so many labourers on the job that they impeded rather than assisted one another. The Viceroy announced his intention of pulling down the Pyramids to obtain the necessary materials. From this act of desecration he was successfully dissuaded when men wiser than he demonstrated that quarrying the necessary stone would be a cheaper process in the long run. Little progress was made with this preliminary scheme as the enthusiasm of the Viceroy rapidly cooled. In 1842 interest was again aroused by the enterprise of a French engineer, M. Mougel, who afterwards became Mougel Bey. Mougel had to face not only the natural troubles of a pioneer, but also the ignorant caprices of his exalted employer. Through all the mists of struggle and failure which obscured his efforts, he still shines out as the real father of modern Nile irrigation. In 1847 he began work on the barrages which were to cross the Rosetta and Damietta branches. Mehemet Ali gave forth a decree to the effect that 1,000 cubic metres (over 1,300 cubic yards) of masonry were to be laid daily, regardless of whether such shock work would be technically advantageous or not. Mougel was faced with a rise some three feet higher that year than it had been a year before, but the Viceroy had to be obeyed. The Frenchman began by digging a foundation trench across the apex of the Delta. Though he had not yet properly excavated the trench, he was obliged to dump large quantities of concrete into it to please the Viceroy. When the barrages had risen above their foundations, their designer was dismayed, though perhaps not surprised, by the appearance of numerous leaks and ugly cracks in the walls. It was he who bore the Viceregal displeasure. Across the Rosetta channel the barrage had 61 arches and two locks, one situated at either end, the total length being 1,524 ft 8-in. 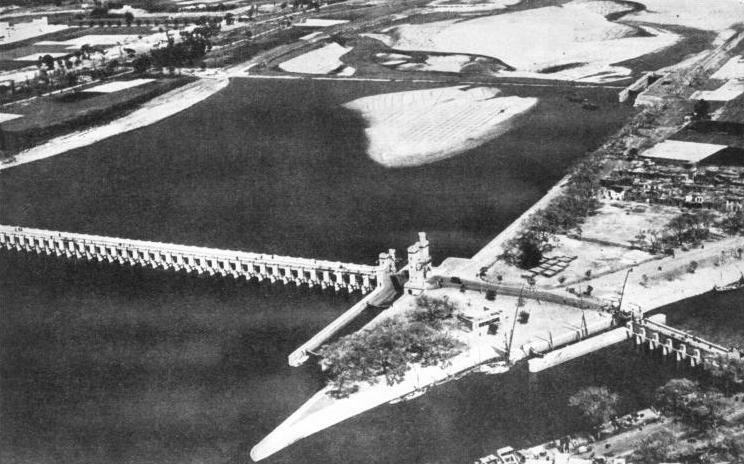 The Damietta Barrage had 71 arches (now reduced to 61) and two locks, the total length being 1,754 ft 3-in. In the original designs the barrages were each provided in the middle with a navigable channel kept perpetually open. These channels would have involved openings of 47 ft 6-in each. Mougel modified the design, replacing the intended channels with two arches of approximately 18 feet each, and putting in an additional lock at that end of each barrage where none had been previously provided for. The remainder of the arches, all of which stood on a long platform of masonry forming the dam itself, were each of 16 ft 5-in span and 28 ft 8-in high, the spring of the arch being just above maximum flood level. Mougel provided each arch with a gate shaped in the form of the arc of a circle. On either side he supported the gate with wrought-iron rods. At the middle of the are he placed a cast-iron pivot, firmly fixed in the masonry. He arranged for the gates to be raised by compressed air and lowered by their own weight acting against a reduced pressure. Through lack of experience in the design of such appliances, the gates were a total failure, and in its original form the barrage acted simply as a weir, being useless as a dam proper. The Rosetta and Damietta sections were joined, end to end, by a long dike or levee of nearly 1,100 yards, from the central point of which the main irrigation channel opened. The original designer carried out the building of the platform and its superimposed arches by means of cofferdams, each cofferdam enclosing some five of the nascent arches. At arches 7 to 10 on the eastern side he encountered fine sand and springs strongly impregnated with decayed vegetable substances. He tried to combat the springs by sinking sheet piles, but the sandy water poured in between them so rapidly that it was impossible, with the means then at command, to excavate the foundations down to the minimum depth allowable. Thus the concrete foundations of this section were only about 5 feet. deep, and the superstructure was riven by ominous cracks even before it was subjected to pressure from the rising flood. RAISING THE HEIGHT of the Aswan Dam. As built, the dam impounded no fewer than one billion gallons at flood time, but it was soon found necessary to increase even this amount. The dam was therefore twice enlarged. Under the guidance of Sir Murdoch Macdonald, the second rebuilding (in 1929-33) considerably increased the dam's dimensions. It is now 6,518 feet long. 87 feet high from the apron level, and 36 ft 2-in broad at the top. In 1848 the Viceroy died, but his death did not lead to improved conditions for the engineers. His successor, Allas Pasha, was frankly uninterested in irrigation works at the Delta. In 1853 he relieved M. Mougel of his post and handed it over, more or less as a sinecure, to Mazhar Bey. Public opinion, however, rightly proved too strong for the new Viceroy’s procrastination, and work on the barrages was resumed, to be completed in 1861. Those responsible succeeded in closing the gates of the Rosetta section in 1863, to supply an increased flow to the Damietta branch of the river. They immediately found that the pressure of the water began to force sand out from beneath the foundations and more cracks appeared in the walls above. In 1867 a still greater accident took place, for a whole section of the Rosetta Barrage, ten arches long, broke off from the rest and moved a perceptible distance downstream. Mongol’s successors surrounded it with a cofferdam 16 ft 3-in high by 6 ft 6-in wide. They filled the cofferdam with stiff clay, having an overlay of stones. In 1876 Mr. (afterwards Sir John) Fowler inspected the work and vindicated the original designer. He reported that the platform and arches were of perfectly sound design and construction, but that the foundations were faulty. How those foundations had come to be faulty we have already seen. In 1882 a new ray of hope for the Delta barrages emerged from the hitherto gloomy sky. Rousseau Bey condemned the works as they existed, and stated that, as built, they could be used only for distributing Nile water to the Delta, and were incapable of storing it up. Colonel Colin Moncrieff, an engineer who had served in India and was later knighted, became head of the Egyptian Irrigation Department in May 1883. In December of the same year he placed Mr. (afterwards Sir William) Willcocks, who was destined to become their saviour, in charge of the Rosetta and Damietta barrages. Willcocks removed the old water-gates and replaced them with new wrought-iron gates of the type patented by F. M. Stoney, whose influence. has survived in later dam and barrage works, on the Nile. These new gates, placed in position after 1884, worked up and down with the aid of rollers in cast-iron grooves fixed into the sides of the piers. The trouble was not over, and the initial improvements were held up through lack of money. The foundations were still bad, and in the summer of 1885, when the Rosetta Barrage was able to hold back a head of about 9 ft 6-in of water, some of the old cracks widened and the cofferdam surround, which had been installed in 1867, began to shift downstream. The Damietta Barrage held a head of about 5 ft 8-in in that year without accident. THE DELTA BARRAGE in Lower Egypt. The first attempts at impounding the flood waters were made at the Nile Delta, where the river, near its mouth, spreads out fanwise into a number of branches. The most important of these are the Rosetta Nile and the Damietta Nile. In 1847 a French engineer, M. Mougel (Mougel Bey) began work on the barrage which was to cross the Rosetta and Damietta branches. The Rosetta Barrage had 61 arches and two locks, and was 1,524 ft 8-in long. The other had 71 arches (now reduced to 61) and two locks; its length was 1,754 ft 3-in. Extensive repairs and rebuilding took place later in the century. In 1890 the work of restoration, under Sir William Willcocks, was completed by the Egyptian Irrigation Department, at a cost of £465,000, and the Delta barrage system was saved. 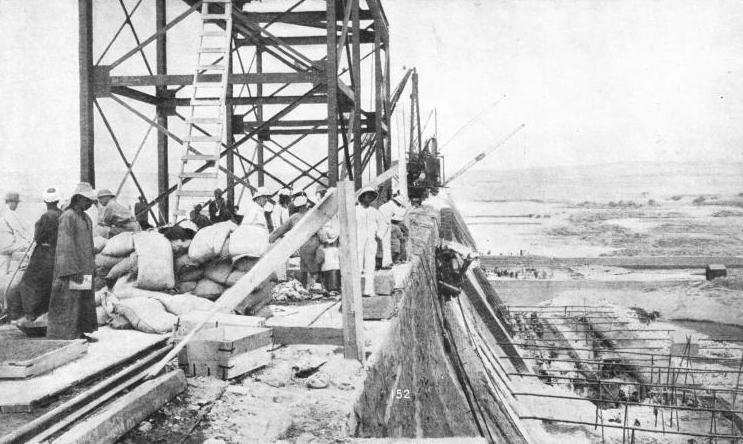 The same year a £1,000,000 loan was obtained for the restoration of the Nile irrigation works, in particular the barrages across the Rosetta and Damietta branches of the river. Another engineer, Colonel Western, at first advised the abandonment of the old works altogether, but at length Willcocks was able to adopt a constructive plan for saving them. In 1886, he successfully exposed part of the foundations of the Rosetta section by building earthen embankments and pumping out the water between these and the masonry floor of the dam. The floor and the underlying strata were carefully reinforced, and the floor was covered with a layer of Portland cement concrete, with a heavy overlay of Trieste ashlar (hewn) stone. The floor was extended some 82 feet upstream by the use of limestone rubble masonry, reinforced along the edge by sheet steel pile-work. In this way Willcocks and his colleagues saved the whole of the Delta barrage system and made it useful. They completed the restoration works on June 16, 1890, at a cost of £465,000 sterling. From the Delta barrage system extends a network of irrigation channels fed by six main canals. Among these is the famous Ismailia Canal, branches of which extend to Port Said and Suez. The flow in two of them can be supplemented by the smaller Zifta Barrage which the Irrigation Department afterwards built across the Damietta Nile, some fifty-six miles north of the main barrage. The flow in these six arterial canals is controlled by regulators at their heads. At intervals of eight to twelve miles along their courses are further regulators controlling supply to branch and distribution canals. The flow in the Delta is not so easily governed by gravity as it can be in Upper Egypt. During the season of low water, Government and private owners employ pumps and waterwheels for lifting the water from many of the Government-owned canals into the private irrigation channels. Four Government pumping stations are installed for irrigation and sixteen for dealing with drainage. The late ‘nineties and the early years of the present century saw a great deal of work carried out on the Egyptian Nile above the Delta. Once decline had been arrested the engineers were able to forge ahead. They remodelled and extended the canals. An immediately corresponding increase in crops and revenue gave tangible evidence of their success. In 1898 they started work on the Asyut Barrage, and on a still greater venture, the Aswan Dam. WITH ITS SOURCES IN TANGANYIKA AND UGANDA and a length of about 4,200 miles, the Nile is of incalculable benefit to the people of the Sudan and Egypt. Its chief tributaries are the Bahr-el-Ghazal, the Blue Nile and the Atbara. Every year, from time immemorial, the Nile has overflowed its banks, leaving behind a rich black silt, eminently suitable for cultivation, Modern engineers have succeeded in impounding the flood waters, so that they can be used all the year round. 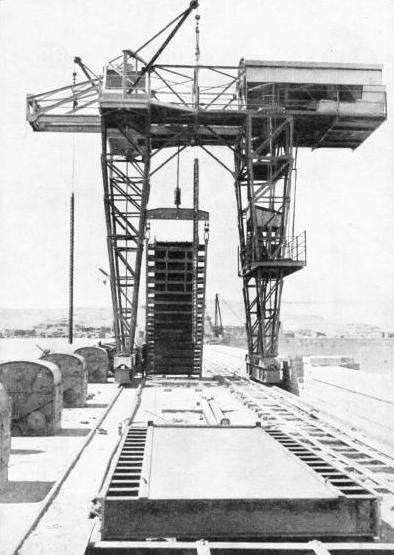 The Asyut Barrage was somewhat similar to the works at the Delta originally built by Mougel Bey. With a total length of about 3,937 feet, the barrage has a central portion consisting of a masonry dam 2,769 feet long. This masonry section contains 111 arched openings, each of 16 ft 4-in span. Each arch is closed by a steel sluice gate, and the piers and arches are founded on a masonry platform 87 feet wide and 10 feet thick. After the bitter experience of work in the Delta, the engineers protected this platform from undermining and scouring by sheet-steel pile-work penetrating the river bed to a depth of 23 feet below the upper surface of the platform. The river bed in turn they protected against erosion for a distance of 67 feet upstream by laying down stone paving on clay puddle. On the downstream side they placed a similar strip of stone paving over an inverted filter-bed. This was to prevent the through passage of sand caused by springs originating from the water above the sluices - one of the bugbears of the Delta barrages in their original form. The piers between the arches are 51 feet long up and downstream, and 6 ft 7-in wide. Every thirtieth pier, however, is double this width. The dam has a maximum height of approximately 48 feet and is capable of withholding a 35-feet head of water. The platform is composed of concrete with a granite superstructure. Passage had to be allowed for navigation. The engineers therefore included a lock 262 ft 6-in long by 52 ft 10-in wide, sufficient for the largest steamer plying on the Nile. They completed this barrage by 1902. In that year a bad famine was threatened by an unduly small rise in the river. The Irrigation Department took the bold step of heading up the available water and carefully regulating its release. The measure was so successful that it was adopted as a normal practice in times of reduced flood. 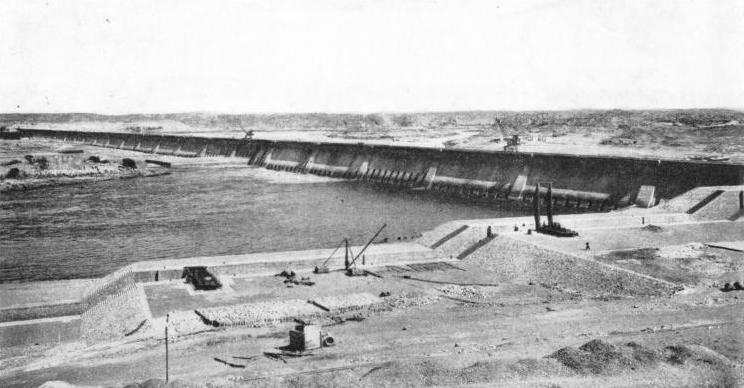 After the successful working of the Asyut Barrage and the rebuilding at the Delta, the Irrigation Department set up similar barrages at Esna, Zifta and Nag Hamadi. But while the barrage was going up at Asyut, a far greater work was in progress higher up the river. This was the world-famous Aswan Dam. The contract for this great work was awarded in 1898, and the design, in essentials, was that prepared by Sir William Willcocks in 1895. The work, however, was carried out under his successors. The entire flow of the Nile was to pass through its sluices, none over the top of the dam. At the base of the First Cataract, above Aswan, the prospectors found a rib of natural syenite crossing the river. So hard was this rock that throughout all the ages of its existence the Nile has scored no really deep channel through it. On this the engineers founded their dam. They built the dam in two sections. The first section began on the east side of the Nile and consisted of a wall of solid masonry 1,800 feet long. The second section, extending to the west bank, was 4,600 feet long and contained sluices and a canal, with a series of locks for the passage of river shipping. Altogether the structure contained some 700,000 cubic yards of masonry, with a maximum height of 96 feet and a maximum depth in the artificial reservoir of approximately 65 ft 7-in where it abutted on the dam itself. At the top, the dam was 9 ft 10-in above high-water level and 23 feet wide at the sluices. The designer provided 180 sluices, located at four different levels. The dam itself consisted of granite rubble set in Portland cement mortar, the sloping sides being faced with squared granite blocks varying in thickness from 12 to 24 inches. With its magnificent natural rock foundation, the Aswan Dam suffered from none of the accidents in building that had marred the progress of the old Delta barrages for so many years. The canal for river shipping was partly on an embankment at the west side of the dam and partly through a rock-cut, and included four locks giving a total descent of 69 feet. The canal was some 6,540 feet in length and 49 ft 2-in wide at bottom. Of the total length of the canal, each lock contributed 263 feet. The lock gates were of the Stoney type, suspended on rollers by which they could be run into recesses in the sides of the locks. The first stone of the Aswan Dam was laid by the Duke of Connaught on February 12, 1899. By June 1902, about a year ahead of their time, the contractors completed the masonry work. On October 20 the sluice gates were closed for the first time, and on December 10 the dam was formally declared complete. This great work, one of the biggest of its kind in the world, was accomplished without accident or unforeseen difficulty, in less than four years and at a total cost of £2,450,000. As built, the Aswan Dam impounded no fewer than one billion gallons of water at flood time, when the pressure against its upstream face was calculated at 5·8 tons to the square foot. Yet in the years following its opening it became clear that the engineers needed still further to increase the capacity of the dam. Over a period of five years, ending in 1907, the Irrigation Department raised the crest of the dam 23 feet. They increased its breadth in proportion, and they reinforced its foundations with huge masonry aprons. As recently as 1929-33, the present administration further heightened the dam to meet the continually growing need for more water. An engineer skilled in Egyptian irrigation, Sir Murdoch Macdonald, was responsible for the re-designing. The length of the dam was increased to 6,518 feet; its height from apron level to 87 feet, and its breadth at the top to 36 ft 2-in. The reservoir, thus enlarged, is now 184½ miles long. As rebuilt, the dam contains 179 sluice gates. The latest of the great barriers across the Nile is in the Sudan. The great Sudanese barrier crosses the Blue Nile about five miles south of Sennar, and is known as the Sennar Dam. This dam, begun in 1914 and interrupted by the war of 1914-18. About the same time as the initial work began on the Sennar Dam, work was started on the provision of another huge reservoir, on the White Nile this time, at Gebel Aulia. This also was held up by the war of 1914-18, but the contractors to the Sudan Government recently resumed work on the building of the new Gebel Aulia Dam and early in 1937 their work had reached an advanced stage. ONE OF THE SLUICE GATES of the rebuilt Aswan Dam. This gate is being lifted by an operating machine before being lowered into its well. The Aswan Dam, as rebuilt, has 179 sluice gates and the reservoir behind it is 184½ miles long. The original dam had 180 sluices, located at different levels - sixty-five with their sills almost on the level of the river bed, seventy-five 14 ft 9-in, eighteen 28 feet and twenty-two 41 feet above the river bed. You can read more on “Conquest of the Desert”, “Fighting Famine in India” and “Fighting the Drought Menace” on this website.